One thing that everyone notices about our electric vehicles is that they are especially quiet, when driving down the road all you may hear is some tire and chain noise. And when parked they are DEAD silent, this is a good thing because it means that they are using almost no energy! On the other hand it is also very dangerous. Last summer My black “Zion” race motorcycle was crashed once in my garage, and was very close to crashing again. The first time the Motorcycle was crashed was when my local news reporter was sitting on the bike shooting a few scenes. He asked me how the bike turns on, so I stepped forward and showed him the switches to turn the bike on, with the lack of a gas engine idle he soon forgot that the bike was still on and preceded to turn the throttle to 100% in a joking manner. 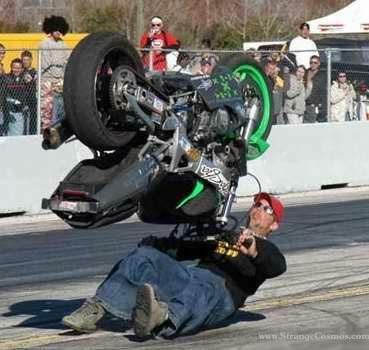 He soon found the motorcycle burning rubber, lifting the front wheel up and then tipping over on top of him. Luckily he walked away with only a few bruises, He exclaimed “I totally forgot it was on, its so quiet!”. This being the first time it happened I thought perhaps it was just him. A few days later at the Mid-Ohio sports car course for the TTXGP race I was in front of the crowd of people walking around the event, most people gazing at the new futuristic electric motorcycles. I had just come back from a short test ride and was sitting on the bike with my feet on the ground and the bike still completely on. A small gathering of people came around the bike, as I was answering questions another person didn’t realize the motorcycle was on and decided to twist the throttle to 100%, with my feet on the ground and my arms crossed in front of me, the motorcycle proceeded to drive clear under my legs! I luckily caught the very tail of the bike and someone else caught the side. I then knew this was going to become a serious issue. The general public right now is trained to the sound and feel of an idling gas engine, this input to your brain is interpreted as “the vehicle is on, be careful”. Unfortunately electric vehicles are not what we are accustomed to. After having two incidents with accidental throttle activation I have installed several safe guards on the new E*speed to help prevent this from occurring. This is a simple to install item that will interrupt the “key on” wire to the speed controller. When the kickstand is down the switch is open and the speed controller is then disabled. When the kickstand is up the switch is closed and the speed controller is activated. This method is one of the best, whenever you are off the bike the throttle is disabled. Another simple way to alert the rider that the electric vehicle is active, simply install a small bright LED and be sure it is pointed right at the rider. 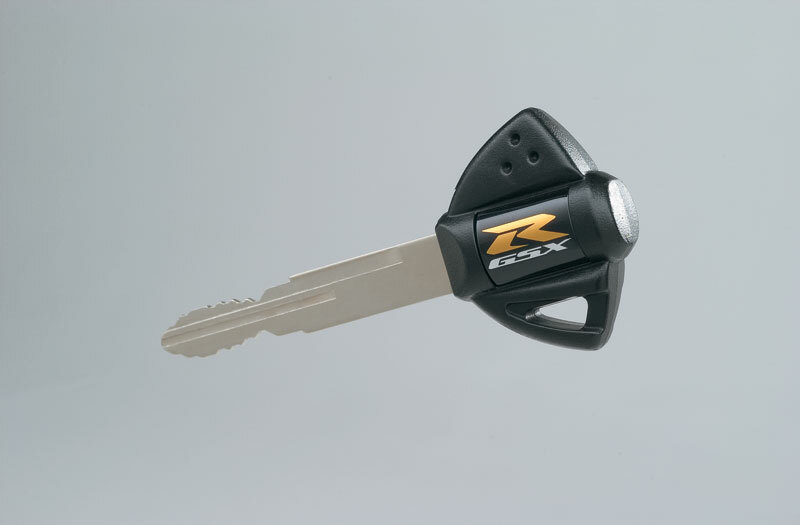 This will prevent curious people from turning the bike on, and accidentally twisting the throttle. A good method to make sure YOU are the only person that can activate the EV. This is a new method I am trying to implement on the E*Speed, I am using very small 3 volt cellphone vibrating motors and attaching then to the handle bar near the throttle and possibly inside the foam of the seat. When sitting on a gas motorcycle that is idling you can feel it vibrate. 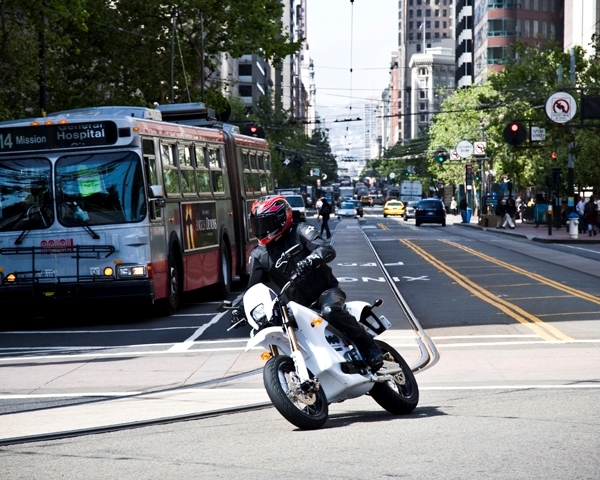 Installing these will create this sensation on an electric motorcycle. I may program these to only be on when the throttle is off or at zero to keep them from annoying you while riding. I quick tested this theory and you can feel a nice vibration in the handlebar even through your leather riding gloves. You may notice I have not done anything that will give an audio or sound output. I did this on purpose because I enjoy the silent ride of EV’s too much. When riding silent on the track you can listen to your tire squeal noise and actually push the bike harder through turns then noisy gas bikes. You can hear when you hit gravel, loose pavement. 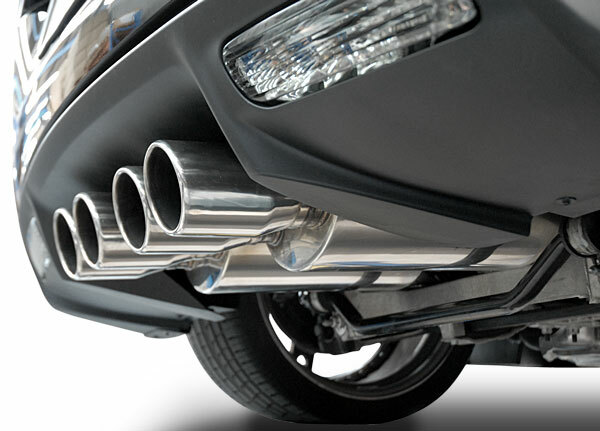 You can hear cars or trucks near by, other car or bike squealing tires to avoid an accident, the advantages to being silent in my opinion out weigh the need of having to make noise, the saying “loud pipes save lives” is only marginally true, defensive driving saves lives, and being silent gives you an advantage. Some may not take these safety features seriously, but please learn from my mistakes and dont end up like this guy. 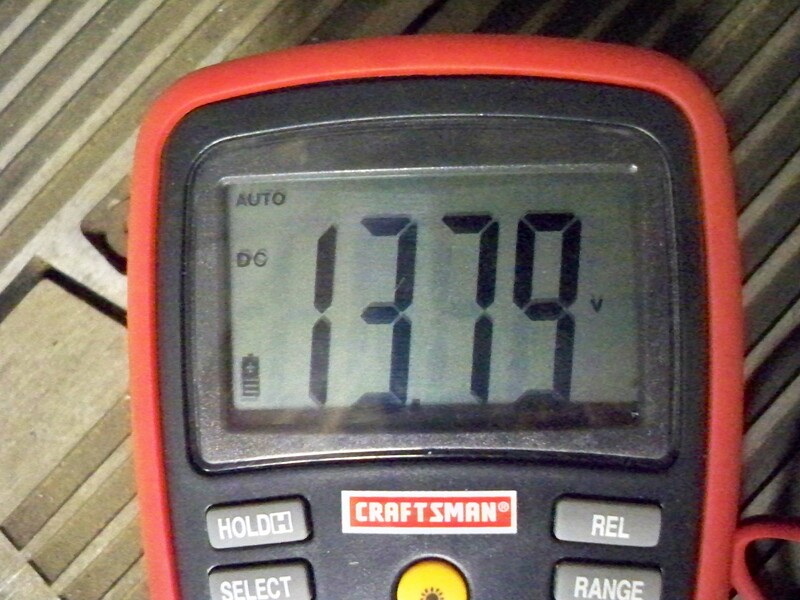 So I decided to check how the solar panel on the roof of my barn was performing, The visual battery voltage indicator showed 12.1 volts from the battery, not too bad considering I still have been charging my small “AA” & “AAA” batteries from it. During the sunny part of the day, in our cold area of Michigan, the solar panel still puts out a strong 13.79 volts to charge the battery. The Amperage was only .53 amps, this was expected especially when there is a good 1/2″ of snow covering the panel. Although the snow builds on top of the panel, it seems to melt faster because of the dark black background color of the solar panel, I believe it heats up from sunlight and melts the snow off. 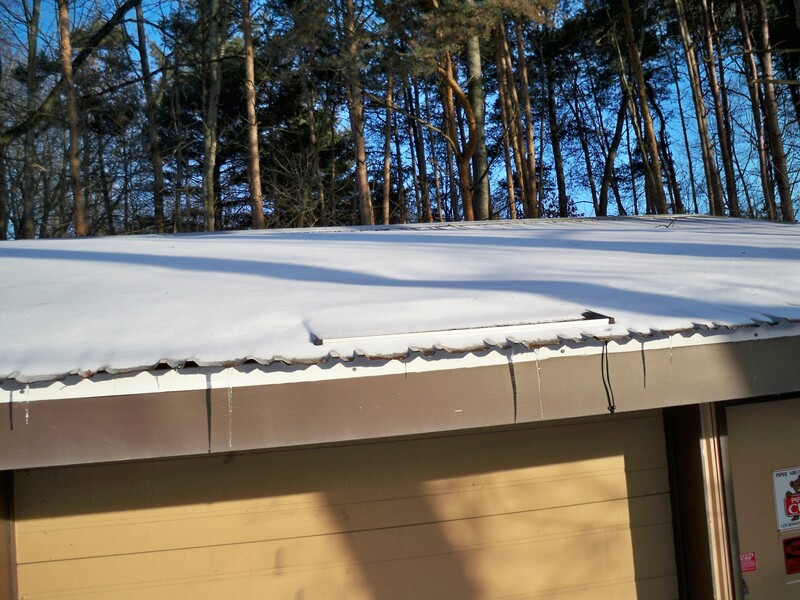 I really did not expect the solar panel to be operating when it was covered in snow, but sure enough it is. Defiantly not as good as it should be, but enough power to at least keep the 12 volt battery charged. 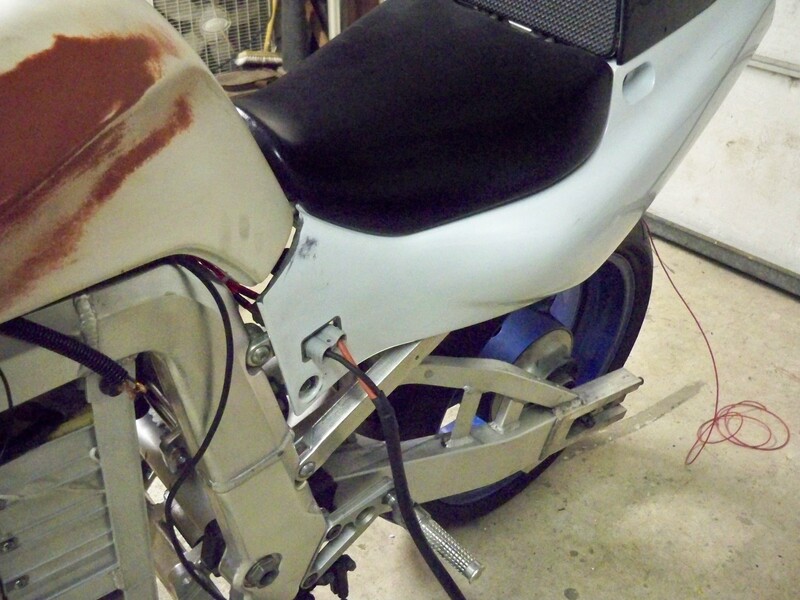 Perhaps in the summer I will add more panels to charge my motorcycles. Then it will truly be energy independent transportation! I thought this might give a little more insight. Well its been a while since I have updated on the Motorcycle progress. Unfortunately its nothing very exciting, but some progress has defiantly been made. 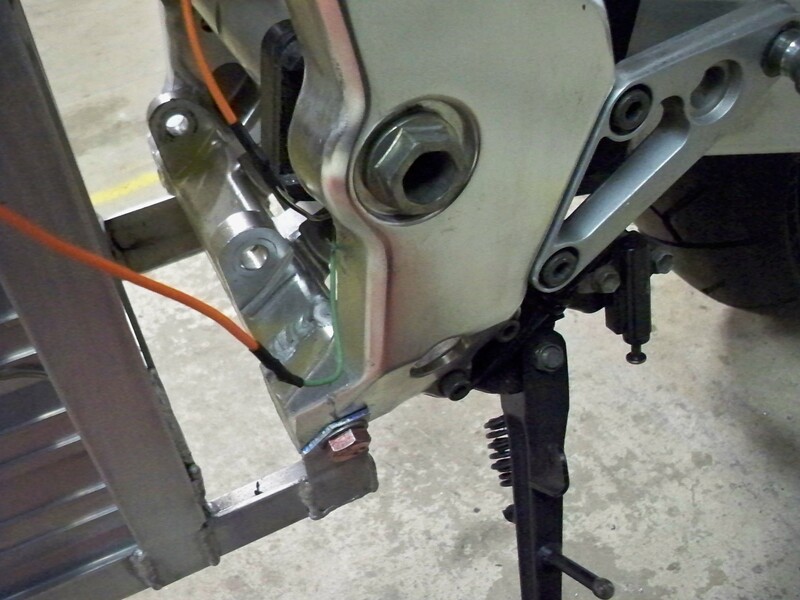 The process of wiring the entire Motorcycle together starts at the drawing board, literally. The first thing I recommend to anyone who plans on making even a semi-complicated circuit is to draw it out on a piece of paper. You dont have to use official schematic symbols or even use straight lines, just draw it so you understand how the circuit is going to operate. I do recommend using a red colored pencil and a black one for power and grounds, This will become an aid when trying to understand where power is going and when you need to branch off power to another device. 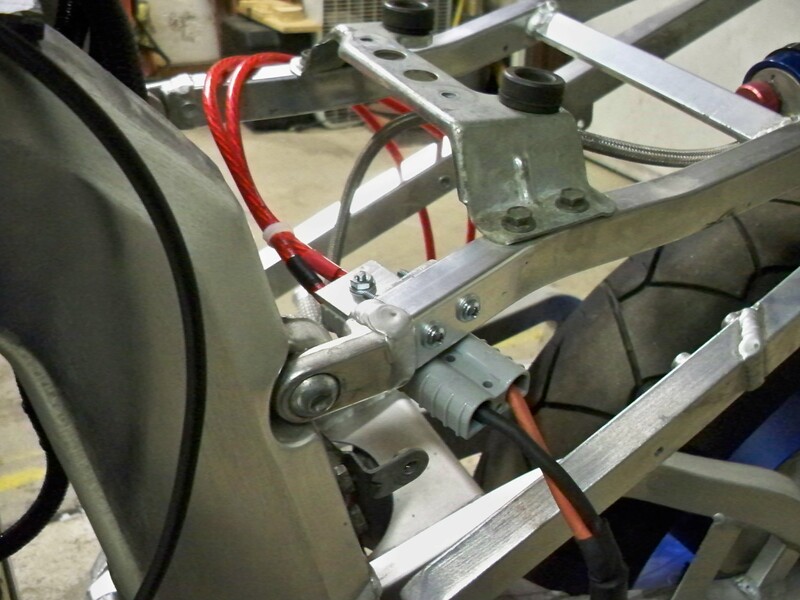 I first decided to mount and wire up the charger port for the bike. This was strategically placed right where your left leg rests against the bike to ensure you will never forget to unplug the charger before you tear out of your garage. The charger wiring is simple, positive goes to the positive connection AFTER the main fuse but BEFORE the contactor (Main relay). The negative is connected to the negative battery post, or the frame ground. Wiring the pre-charge circuit is done differently by many people, but I decided to wire it this way because I do not want ANY current running through my bike when it is “off”. The purpose of a pre-charge circuit is to apply a small regulated amount of power to the speed controller bypassing the contacter completely. This circuit it wired with a small momentary push button switch, when depressed is sends positive battery voltage through a 1000 Ohm resistor then to the speed controller. This then slowly charges the capacitors in the speed controller to near full battery voltage within five seconds or so. 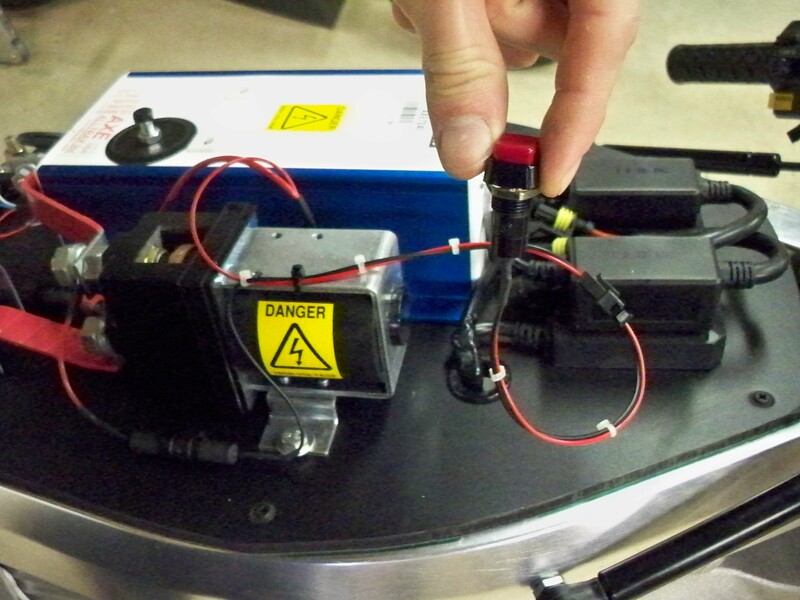 After holding the button down for approximately 5 seconds the capacitors are charged with battery power, and then the contacter (main relay) can close applying full battery power, then the motorcycle is ready to drive. 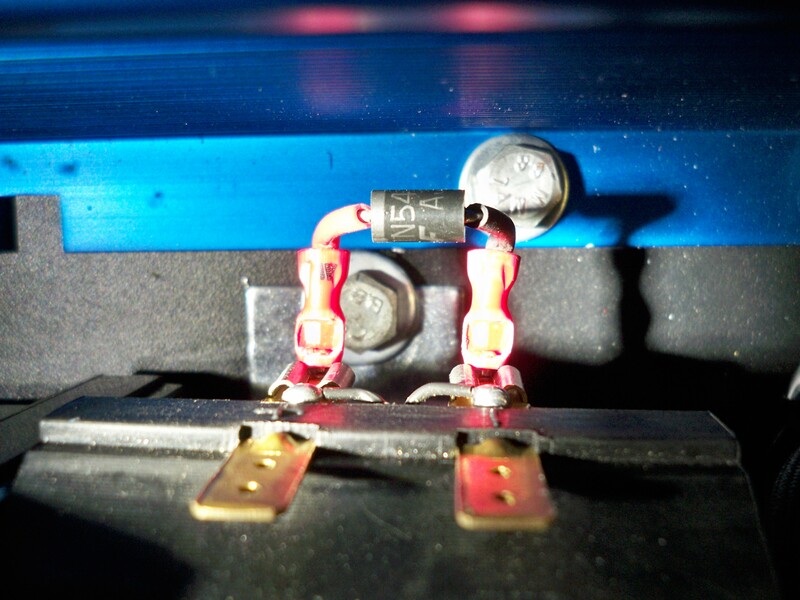 If you do not have a pre-charge resistor you risk surging your speed controller capacitors to the point of failure, and at the same time damaging the main relay contacts, or possibly welding them permanently together! 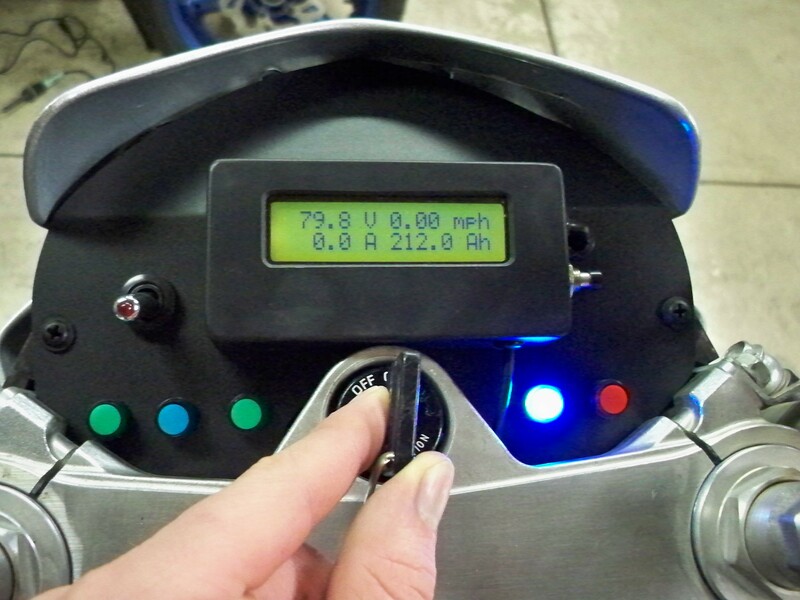 This may sound like a complex activation sequence for the motorcycle, but in a nutshell you hold the pre-charge button for about five seconds, then flip the “on” switch and you’re ready to drive! 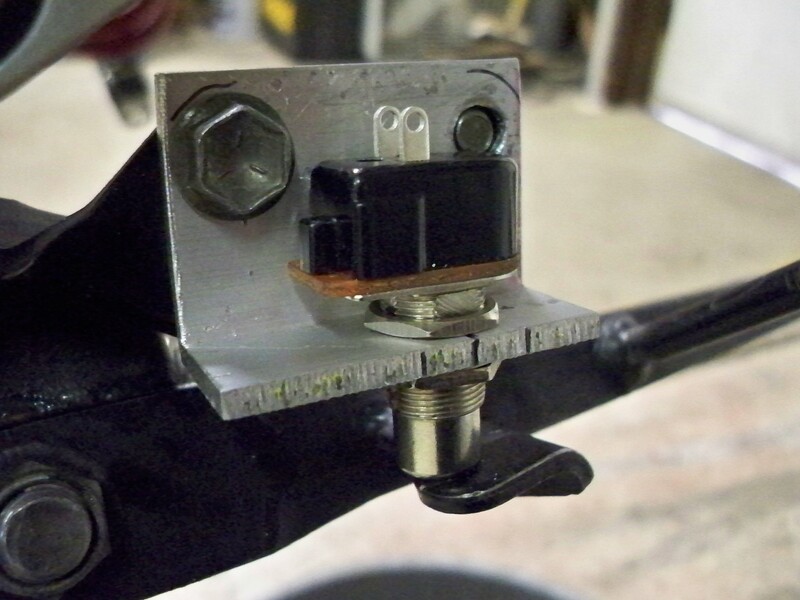 Another device to wire to your contacter is the polarity reverse blocking diode, this little diode is responsible for preventing the contacter from surging reverse polarity power through the system when the contactor is shut off. The theory is that when the contacter is shut off the magnet inside the coil of wire springs back and actually produces electricity, but unfortunately it is the reverse polarity! This can be very damaging to other components, therefore this small diode prevents this reverse polarity electricity from damaging anything. -The direction the diode is installed is very important! Another safety feature I am implementing is the kick stand safety switch, this will keep the speed controller from activating unless the kick stand is in the up position. If for any reason the kick stand is ever lowered the speed controller will be disabled until it is returned to the up position. 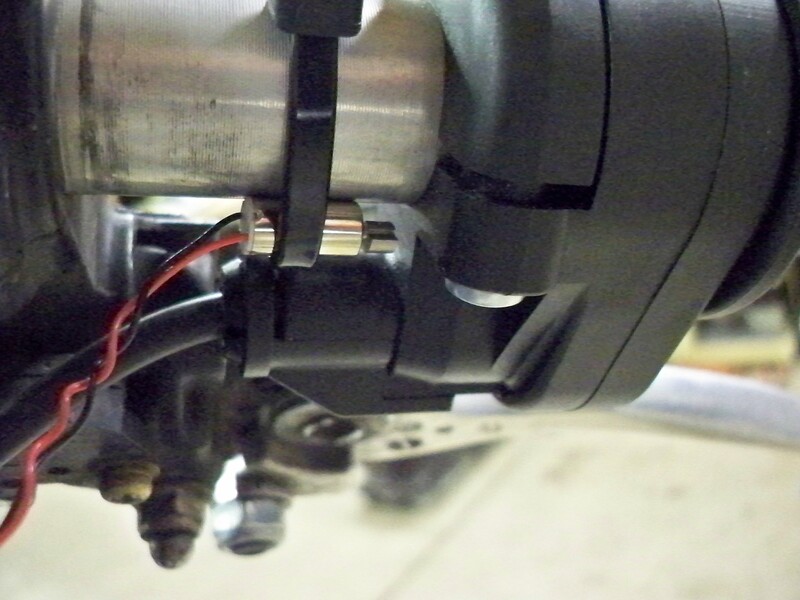 This was put into place to prevent accidental throttle activation when the bike is parked, remember you cant hear an electric motorcycle idling, because they don’t! 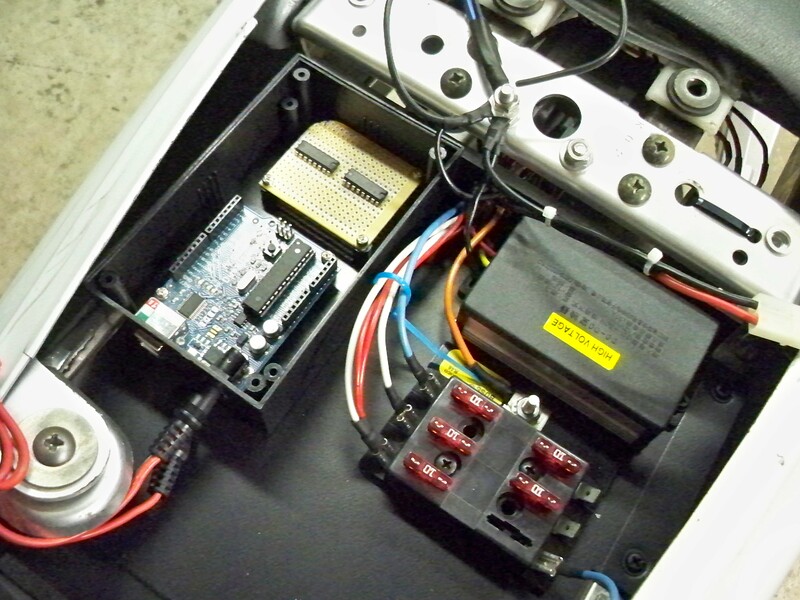 The fuse box, DC/DC converter, and Arduino computer have been installed in the rear of the bike. This has allowed me to start the 12 volt vehicle wiring, headlights, turn-signals, horn, brake lights, etc… Most of this wiring has been completed and everything expect the brake lights are currently operational. The Arduino computer and two L293NE control chips are part of a thermal warning system that I am currently wiring and programing with the help of the C++ based Arduino programmable board, There will be a very informative post on this entire system including the programing in the near future as it is completed.